We are a local family-owned business. Since opening in 2012, we've delivered thousands of hot restaurant orders all over Naples. 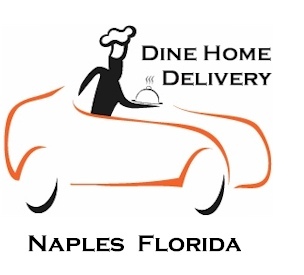 Unlike other delivery options, we bring all of the restaurants in our list to almost all of Naples. We deliver from over 125 local restaurants, and we're adding more all the time. Our fleet of delivery drivers is standing by every day from 4:00 p.m. to 9:00 p.m., just waiting to bring you some delicious restaurant food. So no matter what you're craving, you're sure to find what you're looking for, and we'll bring it to your door hot and fresh in about 45 minutes! Our hours of operation are 4:00 p.m. to 9:00 p.m. every day. Enter your address and zip code on our home page and click Find Me Food! Choose one of the available restaurants and a delivery time. Click on the menu items you wish to order. Click Checkout and enter your payment information. Your food is on the way! A: 4:00 PM to 9:00 PM, every day. Q: What area do you deliver to? A: Almost all of Naples, excluding extreme Golden Gate Estates. We deliver to the following zip codes: 34102, 34103, 34104, 34105, 34108, 34109, 34110, 34112, 34113 (excluding Isles of Capri), 34114 (excluding Verona Walk and locations south), 34116, 34117 (within one mile of Collier Blvd), 34119, and 34120 (within one mile of Collier Blvd). We do not deliver to Marco Island. Q: Which restaurants do you deliver to my area? A: We deliver all 125+ restaurants to all locations we deliver to! A: The delivery fee is usually $5.99, but it can be higher depending on your location and distance from the restaurant. In addition to that, you may add gratuity for your delivery driver (they work hard to make sure your order arrives quickly and accurately). A: The minimum is $25. This may be higher depending on your location and distance from the restaurant. A: MasterCard, Visa, Discover Card, AMEX, and cash. A: Usually about 45 minutes, but it may take longer during peak times or if there is inclement weather or traffic delays. Q: Can I order in advance and request a specific delivery time? A: Yes, to order a gift certificate in any amount of your choosing and have it emailed to the recipient, just click the Gift Certificates button above. If you prefer to have it sent by postal mail, give us a call. Q: Can I use a restaurant gift card or coupon? A: No, we cannot accept gift cards, certificates or coupons issued by the restaurants. A: You can email us at info@dinehomedelivery.com or call us at 239-963-4446. Delivery times are only estimates and are not guaranteed. We do not guarantee the quality of food prepared by the restaurants. Refunds cannot be given for items received as ordered. We cannot guarantee that special requests can be accommodated. Special requests may incur an additional charge. Items listed as market price will be charged accordingly. 15% minimum gratuity required on orders over $50. If you fail to tip your driver the greater of $6 or 15% will be added. In order to accommodate delivery, prices may differ from dine-in.